Longtime State Department diplomat Randy Berry will serve in a new post tasked with improving the situation of LGBT people around the world. 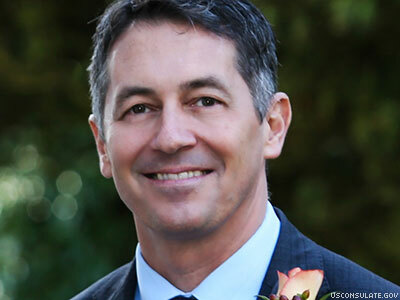 Human and LGBT rights organizations are hailing the U.S. State Department's choice of Randy A. Berry as the nation's first LGBT human rights envoy. "We looked far and wide to find the right American official for this important assignment," Secretary of State John Kerry said in a written statement about the much-anticipated appointment, announced today. "Randy’s a leader. He’s a motivator. But most importantly for this effort, he’s got vision. Wherever he’s served — from Nepal to New Zealand, from Uganda to Bangladesh, from Egypt to South Africa, and most recently as Consul General in Amsterdam — Randy has excelled." The idea of appointing of a special envoy for LGBT human rights was championed by several groups and individuals, including American Jewish World Service, the Human Rights Campaign, Human Rights First. and Sen. Ed Markey, who last year introduced a bill to create the envoy post that will now be occupied by Randy Berry. "By appointing a highly experienced diplomat as our country's first Special Envoy for the Human Rights of Lesbian, Gay, Bisexual and Transgender (LGBT) persons, President Obama and Secretary Kerry have made history and sent a clear message that the human rights of lesbian, gay, bisexual and transgender people worldwide are a priority of the United States government," Ruth Messinger, president of AJWS, said in a written statement following the announcement of Berry's appointment. "As Jews whose ancestors were the targets of genocidal hate just 70 years ago, we understand that the U.S. Government must do all it can to uphold the rights of the people who are the objects of prejudice and hate." The nation's largest LGBT advocacy organization was also early in praising Berry as the first LGBT human rights envoy at the State Department. "At a moment when many LGBT people around the world are facing persecution and daily violence, this unprecedented appointment shows a historic commitment to the principle that LGBT rights are human rights," said HRC president Chad Griffin in a statement issued after the announcement that the new post would be filled by Berry. "President Obama and Secretary Kerry have shown tremendous leadership in championing the rights of LGBT people abroad," Griffin continued. "Now, working closely with this new envoy, we’ve got to work harder than ever to create new allies, push back on human rights violators, and support the brave leaders and organizations that fight for LGBT rights around the world." Other groups were equally pleased with the administration's choice to fill post of special envoy for LGBT human rights. "We congratulate Mr. Berry on being appointed to this important position," said Human Rights First's Shawn Gaylord. "We look forward to working with him to promote equality for LGBT people around the world, to support the activists who are working for change at great risk to themselves, and to ensure that the United States continues to make the protection of the human rights of all people a key foreign policy priority." Human Rights First expects to meet with Berry in the near future, presumably to discuss priorities and collaboration strategies for securing a better future for LGBT people around the world. As the group noted in its statement regarding Berry's appointment, "The special envoy will be tasked with advancing the State Department's initiatives to protect the human rights of LGBT people, responding to discrimination and violence against LGBT people, and building partnerships with LGBT activists around the world." Secretary Kerry expressed a high level of confidence in Berry, describing the current moment in the struggle for LGBT human rights and security in language that signaled momentum is gathering for improvements in the lives of LGBT people, who in more than 76 countries are considered "illegal" by their governments for their very natures. "He's a voice of clarity and conviction on human rights," said Kerry in his official statement to the press. "And I'm confident that Randy’s leadership as our new special envoy will significantly advance efforts under way to move towards a world free from violence and discrimination against LGBT persons." Berry, who the Associated Press reports is fluent in Spanish and Arabic in addition to English, will be leaving his current post as consul general to the Netherlands in order to assume his new role. AP's reporting of Berry's appointment mentions transgender rights as a subject of "heightened public focus" within the Obama administration — taking pains to include the fact that President Obama's newly appointed secretary of defense, Ashton Carter, appears amenable to allowing trans people to serve openly in the military. "White House spokesman Josh Earnest said Monday that Barack Obama welcomed Carter's comments and agrees that all Americans qualified for military service should be able to serve," wrote AP's Josh Lederman Monday.